Tell me! Of course, I'm definitely preferring that you name your favourite final evolution, unless you can provide a cool reason as to why a pre-evolution is your favourite. :3 My personal favourite is Torterra. 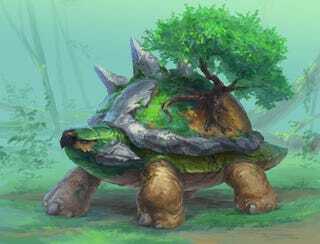 It's a giant tortoise with a mountain and a tree on its back. I mean. He is the definition of boss. I really hope he gets a mega evolution that gains Thick Fat as an ability... Or maybe becomes Grass/Rock. The 4x ice weakness totally cripples him competitively. >: But still. He's a really neat design, and I think the next Pokemon game that comes out, I'll transfer over a Turtwig and run that game through with him. Hopefully, though, the game isn't too easy... My X playthrough, I beat the game with only a Tauros and a Furret as my fully-levelled Pokemons. That's way 2 easy 4 me. Runner-up probably goes to Charizard, specifically the Zard-Y mega-evo. My old car died on Christmas Eve, and I had to drive to Michigan for work on January 2nd, so I wound up rushing into a new car, in this case a red 2009 Hyundai Accent. I decided that, because of the colour (fire type), it was going to be as Zard-Y themed without being tacky. I dig the results. A lot. Onward, Carizard!